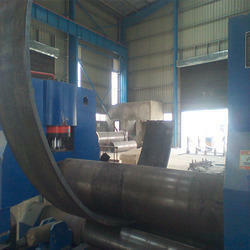 We are a leading OEM Manufacturer of plate rolling & bending services from Delhi, India. We can provide plate rolling/bending/welding services from our state-of-the-art facility in Delhi ( NCR ) at Greater Noida. Plate rolling / bending up to 100 mm thick mild steel/carbon steel/stainless steel plates having a width up to 3000 mm. Radiography can be undertaken for weld joints.